Interleukin (IL)−6 represents one of several possible targets for the treatment of rheumatoid arthritis. Drugs targeting IL-6 can be divided into monoclonal antibodies against IL-6 itself and monoclonal antibodies against the IL-6 receptor. Both types of agent inhibit both classical signalling through membrane­-bound IL-6 receptor, and trans-signalling via formation of a complex between IL-6 and soluble IL-6 receptor. The IL-6 receptor blockers tocilizumab and sarilumab inhibit the low affinity binding of IL-6 to its receptor. 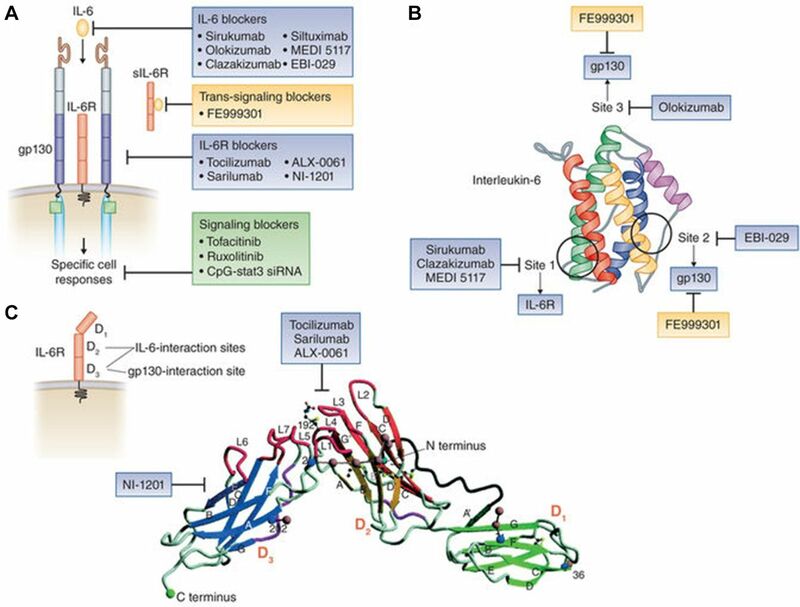 The anti-IL-6 agents clazakizumab and vobarilizumab also block binding of IL-6 to the receptor, while olokizumab blocks the higher affinity interaction of the IL-6-receptor complex with gp130. The doses and dosing intervals of the biologics targeting different elements vary, but no major differences in efficacy or safety have yet been seen between the two approaches, although more studies are needed in this area. In addition to the different blocking actions of monoclonal antibodies, we consider therapeutic strategies including the timing of IL-6 blockade and the use of monotherapy versus the addition of methotrexate. A panel of international experts in the field of rheumatology recently came together to consider the mechanisms by which the IL-6 pathway is targeted. Several molecules have been targeted in the treatment of rheumatoid arthritis. For tumour necrosis factor (TNF) α, four drugs targeting the ligand (adalimumab, certolizumab pegol, golimumab, and infliximab) and one targeting the receptor (etanercept) have been approved. In the case of IL−6, tocilizumab and sarilumab (both approved) target the receptor and four drugs that target the ligand have results from phase II or III clinical trials (sirukumab, olokizumab, clazakizumab, and vobarilizumab). Following a negative review from the FDA, sirukumab development and registration has been stopped. An additional modality based on the selective blockade of IL-6 trans-signalling is in early stage clinical trial development (olamkicept). In addition, abatacept targeting CD80/86, rituximab targeting CD20, and anakinra targeting the IL-1β receptor are approved, and mavrilimumab targeting the granulocyte macrophage colony stimulating factor (GM-CSF) receptor has positive trial results. Proof of concept has also been demonstrated for several other targets, including IL-1β ligand, IL-12/23 (p40), IL-23 (p19), IL-17 ligand, and B cell activating factor, although benefits have so far been either marginal or insufficient to merit progression to general use. As well as pro-inflammatory cytokines, such as TNFα, IL-6, and GM-CSF, B cells and T cells play an important role in the pathogenesis of RA.1–3 Activated B cells and T cells work together to interact with synovial cells to produce a large number of inflammatory mediators, including pro-inflammatory cytokines (TNFα and IL-6), induce matrix metallo-proteinases, promote synovial fibroblast proliferation, and induce osteoclast differentiation.4 This hypothesis is corroborated in a substantial number of clinical trials that show the clinical efficacy of abatacept, an inhibitor of co-stimulatory moieties on T cells. Inflammation is believed to result from or be perpetuated by autoantibodies such as anti-citrullinated peptide antibody and rheumatoid factors. B cells are thought to be responsible for the production of these autoantibodies. The pathogenic role of CD20 +B cells has been validated by the efficacy of rituximab, a monoclonal antibody against CD20, in clinical trials. Two decades ago, it was discovered that IL-6 concentrations were decreased in 80%–90% of patients with rheumatoid arthritis 2 hours after an infusion of infliximab, suggesting that IL-6 is immediately downstream of TNFα in the cytokine cascade in rheumatoid arthritis.5 In addition, methotrexate acts to further inhibit IL-6.6–8 Blocking TNFα reduces the signalling through the IL-6 receptor, which leads to decreased production of other molecules such as soluble intercellular adhesion molecule-1 and vascular endothelial growth factor. When IL-6 binds to membrane-bound IL-6 receptor, the signal is transmitted through gp130 on the cell membrane (classical signalling). In trans-signalling, IL-6 binds to soluble IL-6 receptor (sIL-6R) and the resulting IL-6/sIL-6R complex combines with gp130 to transmit the signal (figure 1).9 Classical signalling via membrane-bound IL-6 receptor occurs only in the haematopoietic system, whereas trans-signalling via sIL-6R can occur in any type of cell. The binding of IL-6 to its receptor is of much lower affinity than the binding of the IL-6/sIL-6R complex to gp130, meaning that the former is easier to block. One key factor determining the efficacy of biologics is the appropriateness of the target, and both IL-6 and the IL-6 receptor are appropriate targets in rheumatoid arthritis. Another important determining factor is trough concentration of the drug (that is, the concentration immediately before the next dose), which should be above the minimum efficacious concentration. The trough concentration is affected by the amount of target molecule, the dose and dosing interval of the biologic, the affinity of Fc receptors for clearing antibodies, and the presence of antidrug antibodies. Other efficacy determining factors include adverse drug reactions and transfer to the site of inflammation. A study of 39 patients with rheumatoid arthritis who received tocilizumab as their first biologic found that the proportion of regulatory T cells increased over 52 weeks of treatment, and the change in these cells was inversely correlated with the change in Clinical Disease Activity Index (CDAI) score (figure 3). The greatest change in the proportion of regulatory T cells was seen in patients who achieved CDAI remission at 52 weeks.18 This implies that IL-6 receptor blockade leads to an increase in regulatory T cells, which is associated with maintenance of well-controlled disease from 6 to 12 months. Whether the same is true for agents targeting the IL-6 ligand is not known. However, IL-6 is known to inhibit the action of transforming growth factor β in inducing regulatory T cells and also plays a role in the production of naturally occurring regulatory T cells,19 so blocking IL-6 should also have this effect. Research is needed to confirm the clinical expansion of regulatory T cell populations during IL-6 blocking or IL-6R intervention therapy. Tocilizumab treatment: change in CDAI and regulatory T cells18 n=39 analysed by Wilcoxon-rank test. CDAI, Clinical Disease Activity Index; TCZ, tocilizumab. Looking at the Disease Activity Score-28 (DAS28) remission rate at 24 weeks in the tocilizumab monotherapy arm of various studies, U-Act-Early stands out with a rate of 76% compared with 49% in SATORI, 40% in ADACTA, 39% in FUNCTION, and 55% in SURPRISE.13 20–23 This may be because IL-6 receptor blockade with tocilizumab was introduced as early as 4 weeks’ disease duration in U-Act-Early compared with 0.5–8.5 years in the other studies. The baseline DAS28 was lower in U-Act-Early than in the other studies, and no joint damage was present.20 This suggests that earlier introduction of an IL-6 receptor inhibitor leads to a higher DAS28 remission rate. Studies are needed to determine whether the same is true for IL-6 ligand inhibitors. Of note, ACR and European League Against Rheumatism (EULAR) do not regard DAS28 <2.6 as a surrogate of clinical remission but rather the ACR-EULAR remission definition24; the limitations of using DAS28 to assess outcomes when applying drugs that directly target the acute phase response irrespective of clinical improvement are detailed in key manuscripts from Smolen et al.25 26 For example, IL-6/IL-6 receptor blocking agents may prevent the induction of acute phase reactants such as C reactive protein (CRP). As DAS28 is a composite score based partly on the measurement of CRP, the effect of these agents may be exaggerated if considering DAS28 alone. Furthermore, comparisons of agents with different mechanisms of action should be considered cautiously; the use of composite measures (e.g. CDAI) that do not incorporate information on acute phase reactants may be more appropriate for this purpose. The results from the SURPRISE study suggest that adding tocilizumab to methotrexate achieves more rapid DAS28 remission than tocilizumab monotherapy and prevents structural damage. However, in terms of safety, the proportion of patients with at least one adverse event or serious adverse event was higher in the add-on arm (60.0% and 13.9%, respectively) than in the switch arm (45.0% and 8.1%, respectively). Gastrointestinal, hepatobiliary, and respiratory adverse events were all higher in the add-on arm.23 In light of these findings in Japanese patients, adding tocilizumab to methotrexate for the first 6 months and then tapering the methotrexate to achieve tocilizumab monotherapy might be a useful strategy. The TNF-IL-6 cytokine cascade plays an important role in the pathogenesis of rheumatoid arthritis (figure 4),18 30 31 and blockade of the TNF-IL-6 axis is now clinically achievable with several biological DMARDs. IL-6, IL-6 receptor, and gp130 are involved in transmitting signals into cells, and blockade can be targeted at different steps on this pathway. The circulating concentrations of IL-6 and soluble IL-6 receptors are different, and the doses and dosing intervals of the biologics targeting different steps vary. No major difference has yet been discovered between the mechanisms of action of anti-IL-6 and anti-IL-6 receptor monoclonal antibodies. However, it is possible that some differences may exist in terms of induction of tolerance and development of antidrug antibodies, and studies comparing the efficacy and safety of the two approaches would be interesting. In terms of therapeutic strategies, earlier introduction of an IL-6 receptor inhibitor seems to lead to higher remission rates; and for the anti-IL-6 receptor inhibitor tocilizumab, add-on to methotrexate rather than switching from methotrexate (at least for the first 6 months), for those who can tolerate it, seems to be an attractive approach.
. Treatment of rheumatoid arthritis with biological agents – as a typical and common immune-mediated inflammatory disease. 93: Proceedings of the Japan Academy Series B, Physical and Biological Sciences, 2017.
. Anti-tumor necrosis factor-alpha therapy of rheumatoid arthritis. Adv Immunol 1997;64:283–350. Competing interests DA declares no conflicts. EHC reports grants from NovImmune. AG, grants and personal fees from Pfizer, grants from UCB, grants and personal fees from Roche, personal fees from Abbvie, Biogen, Bristol Myer Scripps, Chugai Pharma, Eli Lilly, Hospira, Janssen, Novartis, Regeneron, R-Pharm and Sanofi-Aventis; SAJ reports non-financial support from CESAS Medical during the conduct of the study; personal fees from CESAS Medical, Eleven Biotherapeutics, grants and personal fees from Roche Pharmaceuticals, personal fees and other from Genentech, grants and personal fees from Glaxo-Smith-Kline, Chugai Pharmaceuticals, Ferrin Pharmaceuticals, Regeneron/Sanofi, grants, personal fees and non-financial support from NovImmune AG, outside the submitted work; IM reports grants from Roche and Refereron, during the conduct of the study; grants and personal fees from Abbvie, Astra Zeneca, Celgene, GSK, Janssen, Lilly, Novartis, Pfizer, Roche, grants and personal fees from Refereron, outside the submitted work; JS reports grants from Abbvie, Astra-Zeneca, Janssen, Lilly, MSD, Pfizer, Roche, personal fees from Abbvie, Amgen, Astra-Zeneca, Astro, BMS, Celgene, Celltrion, Chugai, Gilead, Glaxo, ILTOO, Janssen, Lilly, Medimmune, MSD, Novartis-Sandoz, Pfizer, Roche, Samsung, Sanofi, UCB during the conduct of the study; TT reports grants, personal fees and other from Astellas Pharma Inc, Abbvie GK, Mitsubishi Tanabe Pharma Co, grants and personal fees from Bristol–Myers KK, Chugai Pharmaceutical Co Ltd, Daiichi Sankyo Co, Ltd, Pfizer Japan Inc, grants from Takeda Pharmaceutical Co, Ltd, Teijin Pharma Ltd, Asahikasei Pharma Corp, Eisai Co Ltd, AYUMI Pharmaceutical Corporation, grants and other from Taisho Toyama Pharmaceutical Co Ltd, Nipponkayaku Co Ltd, other from Astra Zeneca KK., Eli Lilly Japan KK, Novartis Pharma KK, Janssen Pharmaceutical KK, outside the submitted work; The participants/authors received personal fees for their participation in the round table.